Chinese State Councilor and Foreign Minister Wang Yi on Friday met here with his Burkina Faso counterpart, Alpha Barry. Both sides agreed that the China-Burkina Faso cooperation is off to a good start. The signing of the joint communique on the resumption of diplomatic ties between the two countries in May last year has opened a new chapter of bilateral relations, said Wang. 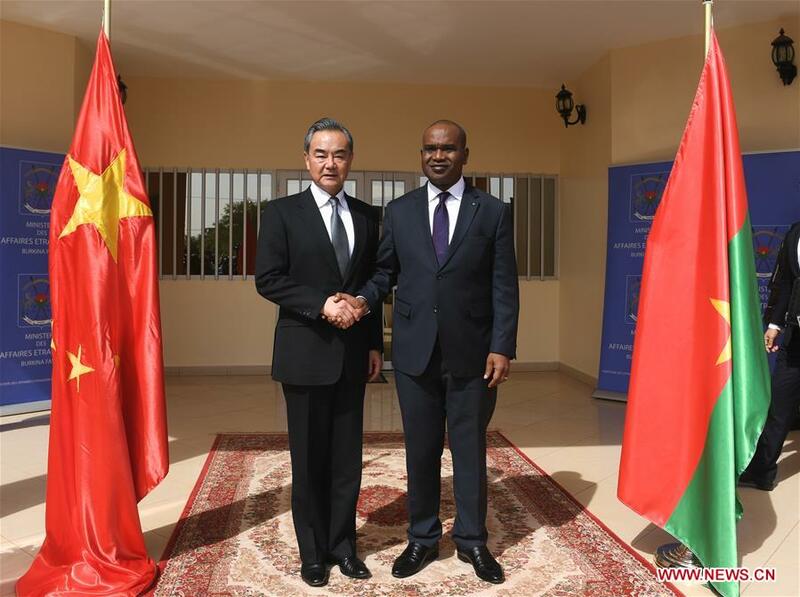 China highly appreciates Burkina Faso President Roch Marc Christian Kabore's decision to resume diplomatic ties with China, which is made on the basis of Burkina Faso's long-term development and its people's fundamental interests, said Wang. He also said that China and Burkina Faso have launched exchanges in various fields and advanced mutually beneficial cooperation in an orderly manner, which are off to a good start, Wang said. "Facts have proved that the decision of Burkina Faso to resume the diplomatic ties with China is one hundred percent correct," Wang said. Noting that it is the first visit to Burkina Faso by a Chinese foreign minister, Wang expressed hope that the visit will boost the implementation of the consensus reached by the heads of state of the two countries, synergize the results of the Beijing Summit of the Forum on China-Africa Cooperation (FOCAC) with bilateral cooperation, and bring more benefits to the people of Burkina Faso. Wang called on both sides to enhance mutual political trust on the basis of the one-China principle, and firmly support each other on issues concerning their respective core interests, so as to ensure that China-Burkina Faso relations will enjoy long-term and steady development. China is willing to work with Burkina Faso to enhance pragmatic cooperation in various fields in accordance with the eight major initiatives proposed at the Beijing Summit of FOCAC, said Wang. China firmly supports Burkina Faso's efforts to safeguard peace and stability in the country and the region, and is willing to deepen bilateral cooperation in peace and security, Wang added. For his part, Barry reiterated the country's firm adherence to the one-China principle, saying the resumption of diplomatic ties has been the country's own decision made on the basis of the fundamental interests of Burkina Faso. Bilateral cooperation has enjoyed sound development, and the people of Burkina Faso feel keenly that the resumption of diplomatic ties with China has helped boost the country's development and improve people's livelihood, thus bringing tangible benefits to the country and its people, Barry said. Burkina Faso is pleased with the good momentum in bilateral relations, and is willing to learn from China's success in development, said Barry, adding that the country hopes that China will continue to support its economic and social development. Burkina Faso appreciates China's efforts to safeguard peace and security in Africa and hopes to enhance cooperation with China in this area, Barry said.